We had decided that a Community of Practice was what we needed at Bioversity to raise the bar of our gender-responsive research. But what now? What could we do to tranform that abstract decision to concrete action? Not that life was statically waiting for us to move. In the meantime, Maria conducted some hands-on workshops on ‘making gender visible at Bioversity’. And a small group of us, and other scattered individuals, kept on swapping ideas and materials around gender-responsive research (or in my case gender-sensitive editing in a gender-blind world, but that will be the subject of a future post). But it was ad hoc and without a shared sense of purpose. Finally, summer 2014 came and I left for the mountains with a stack of books and articles on CoPs, determined to make a plan, based on theory and other people’s experiences so that it would have the best chance of succeeding. The literature on successful and not so successful Communities of Practice suggests that they often pass through similar stages, so I took that as a starting point. It seemed to me that we were some kind of mixture of potential and coalescing so that was my entry point for designing what to do. 5. legacy Leaving something behind Understanding new circumstances Closing gracefully and seeing new trajectories Recasting the practice into a legacy. 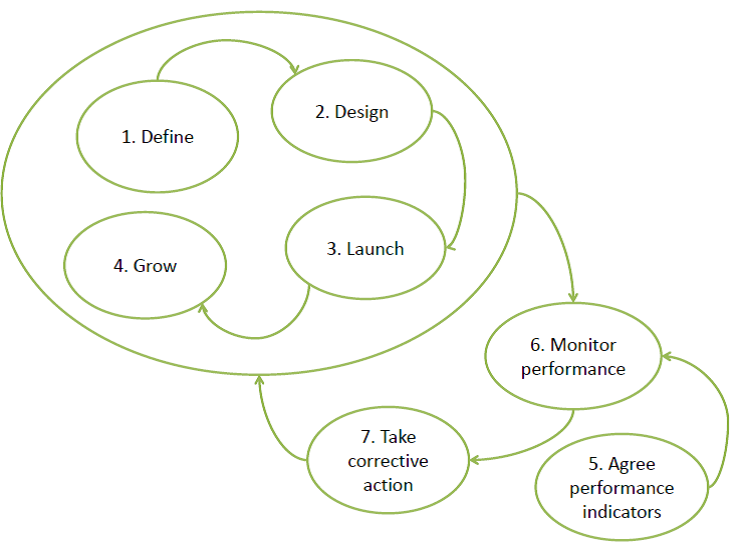 Like all Systems Thinking Practitioners with a background in Checkland’s Soft Systems Methodology (see below), my planning consisted of drawing lots of bubbles connected with curvy arrows. Each bubble is a system of human activities (i.e. interacting actions that together have the emergent property of what you want to achieve) and each system can have as many subsystems as you need for it to be useful. The literature seemed to suggest four steps: Define, Design, Launch and Grow. I read more about Define and came up with some more specific actions that together might help us get off on a good footing with this CoP. You can see them in the figure below. At this point, there was a small group interacting quite regularly on how this might proceed: Marlene Elias, Riina Jalonen and also Dietmar Stoian, Anne Rietveld, Maria and me. 1. Who to participate? We invited everyone! All staff at Bioversity since we don’t know who is interested and what background or aspirations they have in gender-responsive research. And we sent them a questionnaire to find out how they would like to develop their practice. That’s the needs analysis part. The questionnaire asked them about their personal destination—where they wanted to be in 5 years with their gender-responsive capabilities. It also asked about how they saw the destination of the collective—what would the group as a whole be achieving in 5 years? The combined responses painted a great vision of where we might go—much richer than I expected. One must never underestimate the power of bringing collective voices together. With this information in mind, we started planning for Bioversity’s Science Week (held last week) our one annual opportunity to bring together almost all our senior scientific staff from every part of the world to share knowledge and spark innovative thinking. Blackmore, Chris. 2010. Social Learning Systems and Communities of Practice. London: Springer. Iaquinto, Ben, Ray Ison, and Robert Faggian. 2011. 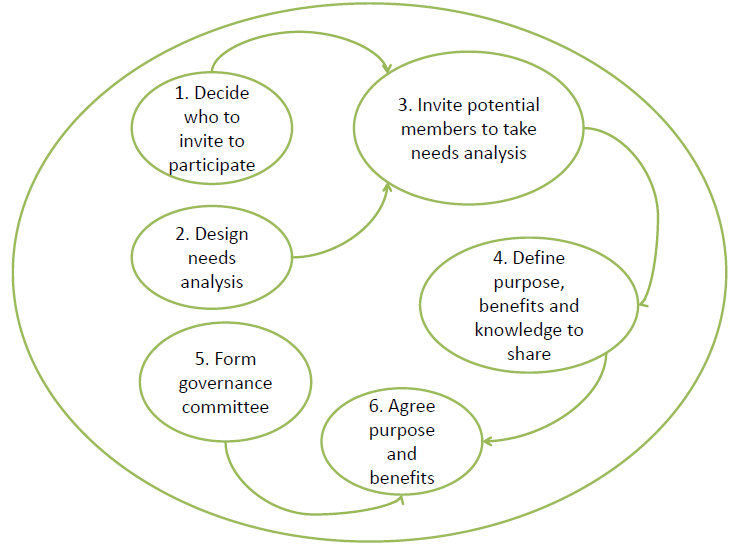 “Creating Communities of Practice: Scoping Purposeful Design.” Journal of Knowledge Management 15 (1): 4–21. doi:10.1108/13673271111108666. McDermott, Richard. 2000. “Knowing in Community: 10 Critical Success Factors in Building Communities of Practice.” IHRIM Journal, no. March: 19–26. ———. 2003. “Building Spontaneity into Strategic Communities: Eight Tips to Put Excitement into Management-Created CoPs.” KM Review 5 (6): 28–31. ———. 2004. “How to Avoid a Mid-Life Crisis in Your CoPs: Uncovering Six Keys to Sustaining Communities.” KM Review 7 (2): 10–13. Probst, Gilbert, and Stefano Borzillo. 2008. “ScienceDirect – European Management Journal : Why Communities of Practice Succeed and Why They Fail.” European Management Journal 26: 335–47. Wenger, Etienne. 1998. Communities of Practice: Learning, Meaning and Identity. New York: Cambridge University Press. Wenger, Etienne, Richard McDermott, and William M. Snyder. 2002. Cultivating Communities of Practice. Boston, Massachusetts: Harvard Business School Press. Checkland, Peter, and John Poulter. 2010. “Chapter 5: Soft Systems Methodology.” In Systems Approaches to Managing Change: A Practical Guide. Springer.